At the opening of the 37th session of the Human Rights Council, nearly one hundred world leaders (e.g. presidents, prime ministers, and ministers) delivered high level speeches commenting on the state of global human rights in 2018, and presenting their country’s priorities for the year ahead. The Universal Rights Group (URG) has analysed the content of all 98 statements, to identify the key human rights themes, debates, situations of concern, and priorities for 2018 and beyond. The results of the analysis are presented below in a series of ‘word clouds’ (with the size of the word reflecting the total number of mentions of the relevant theme/situation). 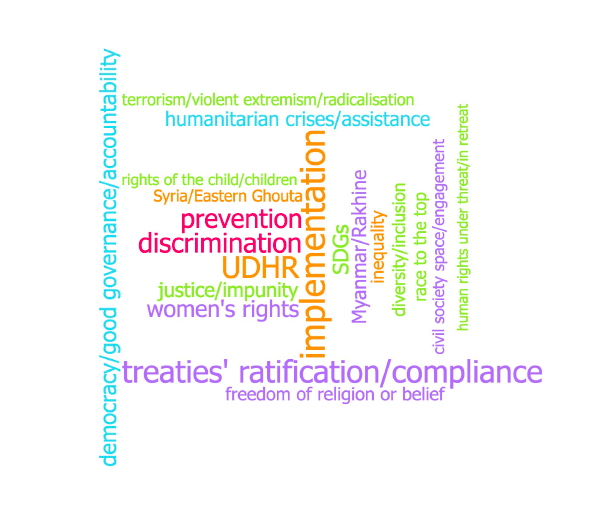 URG has generated word clouds for: economic, social and cultural rights themes; civil and political rights themes; groups in focus themes; cross-cutting/other themes; country or regional situations; and institutional themes related to the UN human rights bodies and mechanisms. Finally, URG identified the ‘top 20’ most frequently mentioned themes across all categories. These are presented in a separate word cloud. 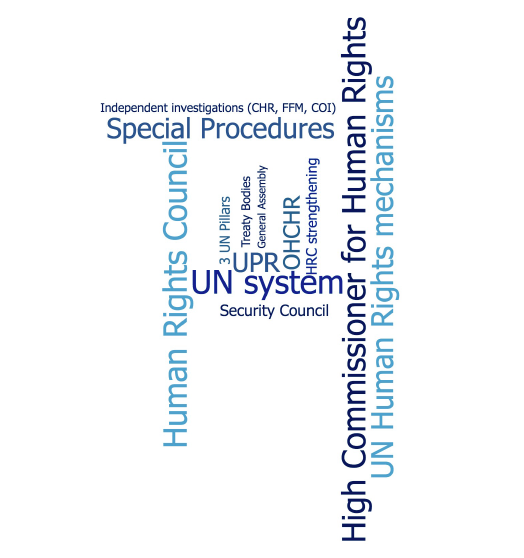 URG’s analysis found that the 98 speeches contained references to over 237 human rights topics or subjects. 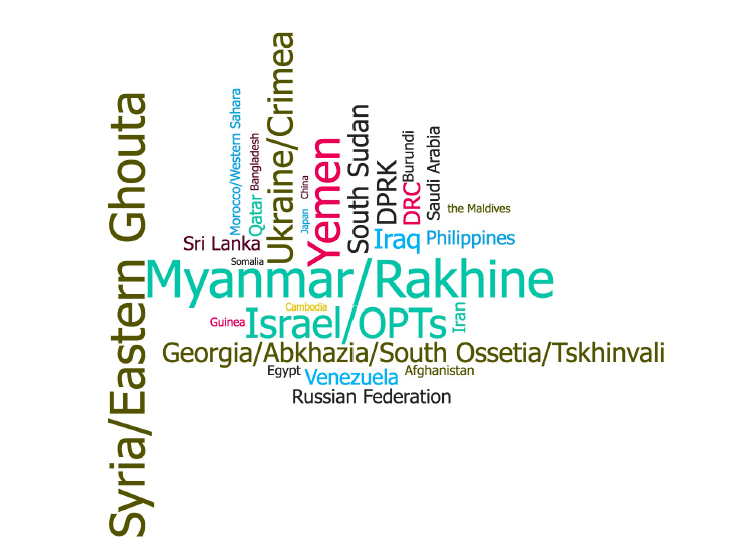 When clustered, it becomes clear that the 98 speeches addressed around 57 broad themes. 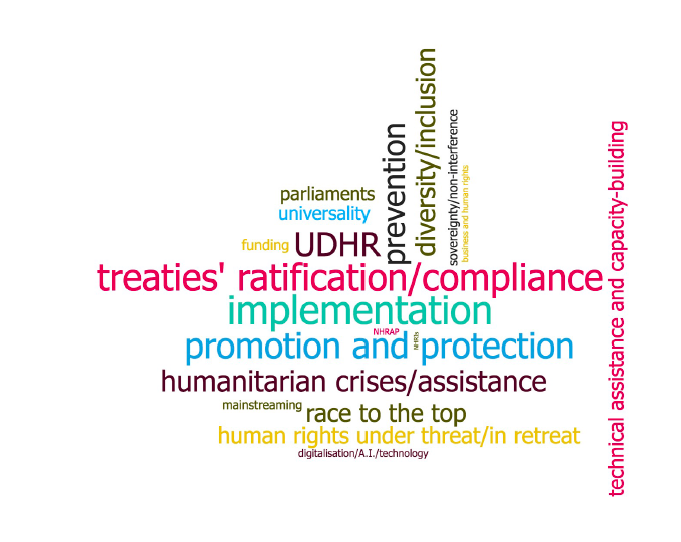 To identify key themes for 2018, URG counted the number of mentions of those broad themes across all high-level speeches (only themes mentioned by at least four different State representatives were included in the final results). The most widely referenced human rights topic, by governments in 2018, was the ‘Implementation Agenda.’ This includes repeated reference to the need to close the ‘implementation gap’ and the calls for the Council to focus more on its effectiveness and impact ‘on-the-ground’. 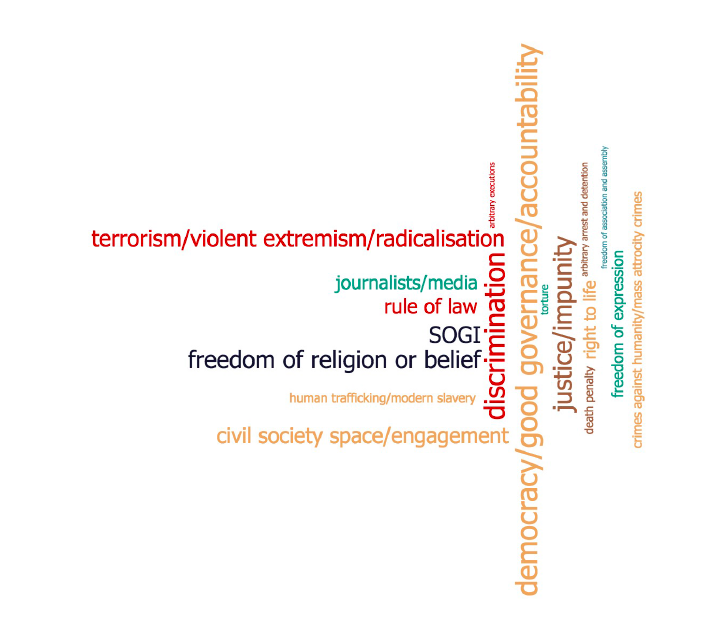 Other key human rights issues and priorities for 2018, according to our analysis of the speeches of high-level government representatives, include: the Sustainable Development Goals; equality and inequality; the Universal Declaration of Human Rights (UDHR); discrimination, including racism, xenophobia and religious intolerance, including Islamophobia; the role of the Council in preventing human rights violations and crises through dialogue and cooperation; the rights of migrants and refugees; democracy and good governance; and women’s rights and violence against women. Looking at cross-cutting / horizontal human rights concerns, State representatives drew particular attention to: prevention; diversity and inclusion; the continued relevance and importance of the UDHR; and the important role of national human rights institutions (NHRIs). Turning to civil and political rights, as already noted, issues around ‘discrimination’ were heavily cited by governments. Other important themes included: violent extremism and radicalisation; democracy and good governance; civil society space, and stopping ‘reprisals’; justice and impunity; the rule of law; and freedom of religion and belief. 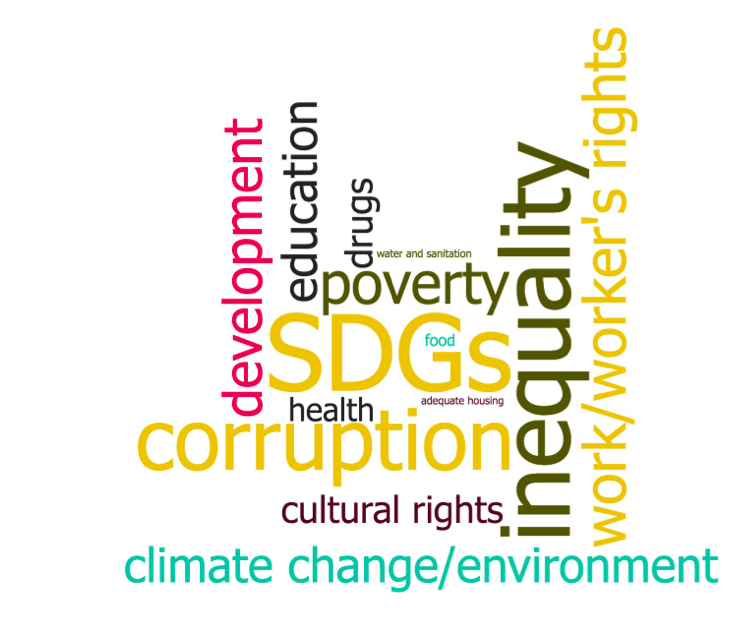 In terms of economic, social and cultural rights issues, States highlighted, as an overriding priority, the importance of leveraging human rights, including economic, social and cultural rights and the right to development, to support the fulfilment of the 2030 Sustainable Development Goals ‘leaving no one behind.’ Other key issues in the field of ESC rights that were highlighted by State dignitaries include, inter alia: climate change and the right to a healthy environment; issues of inequality and equality; and the impact of corruption on the enjoyment of human rights. 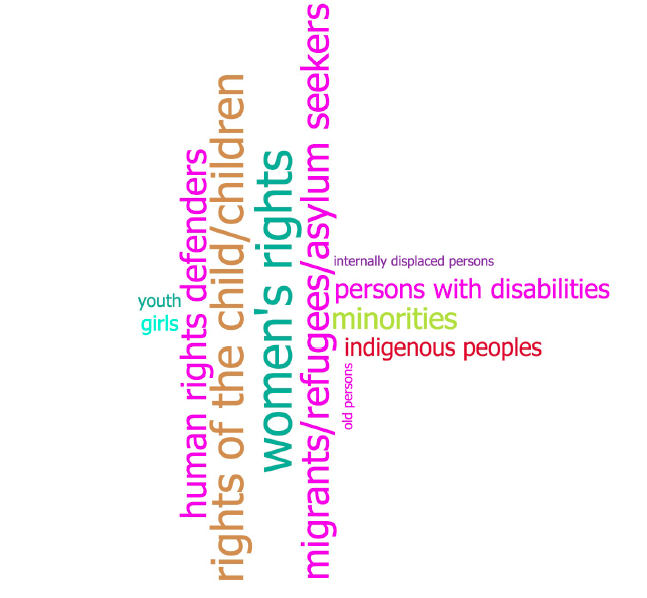 Turning to ‘groups in focus’ or ‘groups in vulnerable situations,’ in 2018 States drew particular attention to concerns over the rights of the child/children; the rights of migrants and refugees; and women’s rights, including in the context of gender equality and violence against women. Many dignitaries also acknowledged the invaluable work undertaken by human rights defenders in this year of the 20th anniversary of the Declaration. Regarding country-specific human rights violations of particular concern to the international community, States made repeated references to: Myanmar/Rakhine; Syria/Eastern Ghouta; Ukraine/Crimea; Israel and the Occupied Palestinian Territories; Georgia; Yemen; and the DPRK. Finally, a range of governments used their speeches to express support for the Council and its mechanisms (the Special Procedures and the UPR). Many dignitaries also recognised the invaluable contribution to human rights of H.E. Zeid Ra’ad Al Hussein during his four years of services as High Commissioner. Additionally, the process of Human Rights Council strengthening, in order to increase the efficiency and effectiveness of the Council, featured prominently in many statements.